An emphasis on bacterial infections and innate immunity. The Aronoff lab is addressing the problem of female reproductive tract infections through integrated explorations of host-microbial interactions, microbial pathogenesis, innate immunity, and mucosal immunology. We are primarily interested in understanding how innate immune defenses against bacterial infections are regulated. In particular, we focus our studies on macrophage polarization and function in response to infection using toxigenic, Gram positive bacteria that cause life-threatening disease of reproductive-age women. 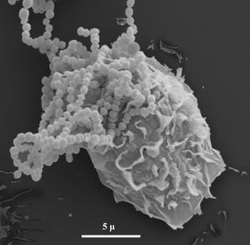 One of these pathogens is the anaerobic bacterium Clostridium sordellii, which causes reproductive tract infections and a unique toxic shock syndrome following childbirth or spontaneous/therapeutic abortions. Another pathogen we study is group A Streptococcus (GAS), a more common cause of toxic shock syndrome, which is also a major cause of postpartum sepsis. Group B Streptococcus (GBS), is our current work-horse of the lab. This bacterium is an important cause of infection-related preterm birth, stillbirth, and neonatal morbidity and mortality.